Detective Constable Peter Grant is adjusting to his new life as the apprentice to one of Britain’s last wizards (who is also Peter’s superior in the Metropolitan Police) and trying to come to terms with the ways in which his life changed during the first book, “Rivers of London”. His latest case is to investigate the untimely deaths of a series of men which Peter and his boss believe may have been caused by a supernatural being. The victims were seemingly unrelated, the only apparent connection being that they were all big jazz fans and part of the investigation involves Peter revisiting his childhood growing up as a the son of a respected jazz musician. Although that plot makes up most of the book there is also another investigation into a rogue magician who was associated with an unsavoury supernatural club and may be the most dangerous adversary Peter has yet faced. 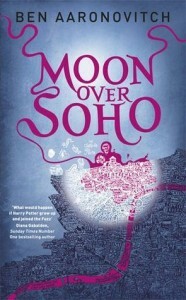 I really enjoyed Rivers of London, the first book in this series, and I thought Moon Over Soho was almost as good although the plot does take a while to really get going. The pacing is a little bit slow to begin with as Peter Grant starts to investigate two different sets of separate supernatural murders but it picks up pace in the second-half of the book and has a fast-moving climax. Both the mysteries are reasonably interesting, although the background history of Inspector Nightingale and the Folly is probably the most intriguing bit again, with a bit more revealed in addition to what we learned in Rivers of London – Nightingale’s return to the long-abandoned school where he learned his magic was a particularly effective scene. I think Aaronovitch possibly needs to work a little bit harder on his plot twists, since this is the second book in a row where I've spotted one some time before any of the characters figured things out. Grant's narration was entertaining again, mixing a fair amount of humour with some deft exposition about policing, magic and London, and he continues to be a believable character even when he is doing something very foolish. Some of the supporting cast are good characters, although some others struggle to develop any characterisation beyond a couple of quirks. Overall, it was an entertaining read, and the unresolved plotline with the rogue magician is something that seems like it should provide good material for future books in the series.